Or Darklights, Brenda and I decided that the left side needed to be darker, well she actually decided I needed to cut off one third of the quilt, the left side to be exact, can we say chest pains anyone? Anyway... I'm not putting the branch parts on yet, first I'm working on the lighting issue more of the "light streaming through the tree canopy" feel, if I don't do it now and go back in later it'll end up looking like the lighting was an after thought. I pretty much have the branches resolved. 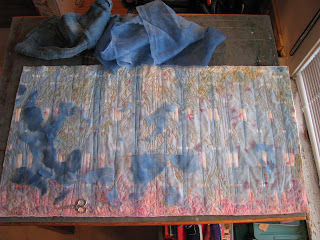 As it is the quilt, several pictures ago, looks great, but I want it to be stunning which means many many hours of stitching, hand sewing, bits of fabric, threads, fibers etc... to make this piece really sing. I've been rounding up all of my pinks, carnation pinks, peaches, and hot hot pinks for the crab apple blossoms. I have a beautiful fleshy pink dupioni for the whites of the blossoms. And I started gathering various greens and yellows. Going through my pile of silks has made me see that I'm very low on greens, time to start dyeing again, and the timing couldn't be better as this weeks Natural Surfaces Challenge is Sping Green! Labor of love - this one's going to be a LOT of work!